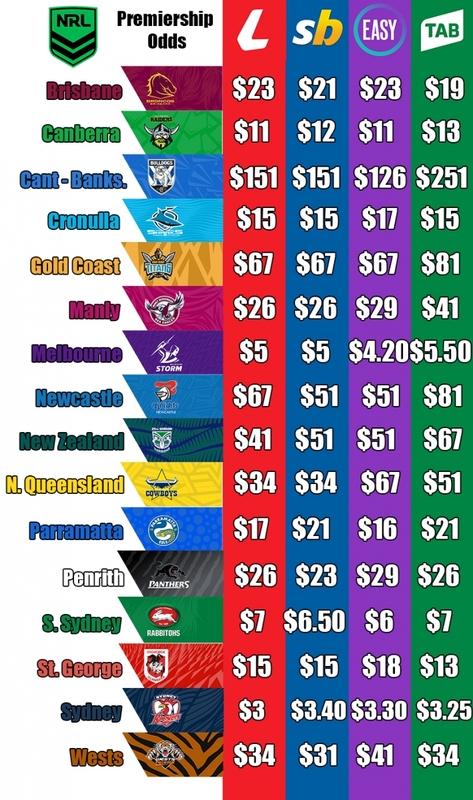 The 2019 NRL season is underway and the major betting agences in Australia have already shown some key differences in their premiership betting odds. To ensure that you get the best odds avilable when placing your NRL premiership bet, we will be curating a odds comparison table throughout the entire NRL season this year! Check back to this page on a Monday or Tuesday after the weekend's games to see the updated odds and most importantly, the differences between the major betting agencies in Ladbrokes, Sportsbet, BetEasy and the TAB! If you fancy a bet on the AFL premiership in 2019 as well, you can check out our AFL Premiership Odds Comparison!